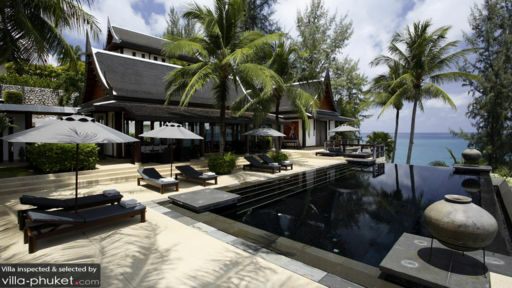 Found along the Western coastline of beautiful Phuket, Villa Baan Laemson 1 is a traditional Thai property with six bedrooms, an infinity swimming pool, and beach frontage that is open to guests. The stunning property boasts luxurious aesthetics coupled with untamed nature including the lush gardens and Arabian sea. Also close by to the villa are the popular beaches of Phuket, Kamala beach and Laem Singh beach, perfect for a fun day out with the fam. With privacy and an almost private beach, the villa is perfect for a getaway with friends and family. Six bedrooms, air-conditioned and with excellent views of the Arabian Sea, are found at Villa Baan Laemson 1. Three bedrooms are housed as separate pavilions, two as double bedrooms, and the last one also with a double bed. The bedrooms feature a deep wood décor with dark mahogany and teak wood furniture. Large glass windows overlook the luscious foliage and the ocean making for a nice view early in the morning. The bedrooms are elegantly appointed and are instantly homely as well as inviting. All of the bedrooms have a sitting area with two armchairs facing the window. Five of the bedrooms have en-suite bathrooms with necessary, modern amenities and facilities for your convenience. The gorgeous infinity pool is all dark stone on the floor, affording it a majestic look while it gazes at the beautiful ocean with its crashing waves. The edges of the pool are marked by cauldrons for a luxe vibe. There are numerous sun beds on the pool deck for lounging and sunbathing for guests. In the distance as you lounge in the water, enjoy a view of the lush foliage and the sandy shores of the beach including the towering palm trees that dot the shoreline. 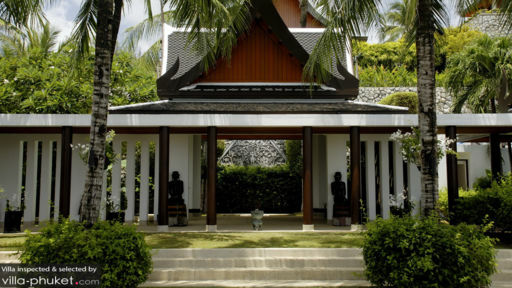 An outdoor sala, traditional Thai structure, houses the extravagant and luxurious dining area to provide an otherworldly and one-of-a-kind dining experience to guests. A well-appointed living room where you’ll find several artefacts and interesting antiques decorating each and every corner of the room. There is ample seating in the living area including plush couches, armchairs, and chairs. The walls are graced by Asian artwork, the traditional Thai ceiling features trusses and exposed wooden beams home to hanging fans. A view of the ocean on one side and luscious greenery on the other side is what you’ll get at the living area. The dining area is found outside on the porch so that you have a gorgeous view when you dine out in the fresh air. With the tropical breeze keeping you company, enjoy a lavish meal with loved ones for a cherished memory. A terrace is another hangout spot for guests, for a quiet moment amidst nature perfect as a reading corner! The villa is fully-staffed to look after you during your stay and to ensure that you have everything you need. From housekeeping to security everything is taken care of the by the staff and they offer car services to take you around town. For special requests like meal preparations, laundry, massages, boat rentals the staff is happy to make arrangements but at an extra cost. 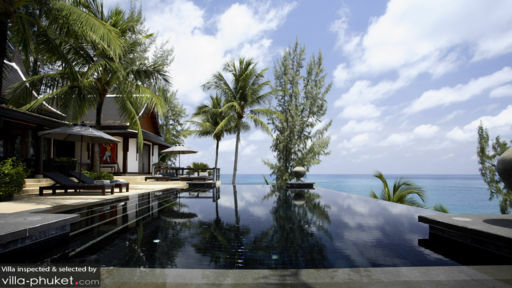 The villa itself is found right on the beach and also provides easy access to Kamala beach and Laem Singh beach both of which are replete with activities and fun things to do including feeding and interacting with a flourishing marine life. Engage in water activities or eat out at one of the beachside restaurants like Silk restaurant and get drinks at HQ Beach Lounge.